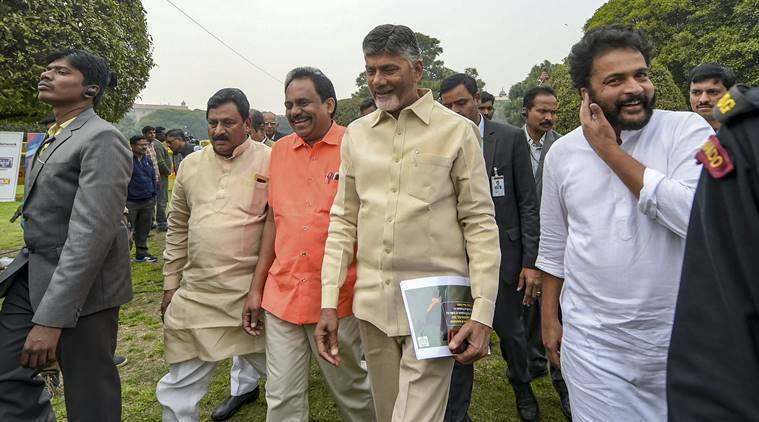 Andhra Pradesh Chief Minister N Chandrababu Naidu along with TDP MPs and MLAs met President Ramnath Kovind at Rashtrapati Bhavan here on Tuesday and raised demand for special status for the state. “We met the President and apprised him of our demands. The central government has ignored the Andhra Pradesh bifurcation act promises. Modi government is passing the time without releasing grants to the state. “For the development of Hyderabad there has been a struggle for 60 years and today it stands as a world-class city. On seeing the injustice done to Andhra Pradesh many people went into depression and recently a physically challenged man Arjun Rao has committed suicide over the special status not being granted to the state,” Naidu said at a press conference. He said that a possibility of pre-poll alliance with opposition parties cannot be ruled out. “Nothing is decided yet but possibility of a pre-poll alliance with opposition parties cannot be ruled out,” he added. Bringing his battle for special status for his state to the national capital, Naidu on Monday went on a daylong fast that became a rallying point for opposition unity for the second time in less than a month to take on the BJP ahead of the Lok Sabha polls.